If you’ve ever shaved, waxed or plucked hair anywhere off your body, you’ve more than likely had experience with ingrown hairs. And if you’re one of the lucky few (or unlucky, depending on whether or not you’re a popaholic) who has never experienced an ingrown hair, feel free to check out this increasingly popular Instagram account that gives you an up close and personal look at some juicy removals. Now, onto the scientific stuff — here’s everything you need to know about ingrown hairs! Why do I get ingrown hairs? Ingrown hairs can happen to anyone, whether you’ve undergone some form of hair removal or not. However, people with very coarse or curly hair are more prone to getting pesky ingrowns, particularly if they shave. Why? Because when you shave, you’re cutting hairs off right above the skin, often at a slight angle that makes them sharper than normal. This can cause hairs to curl back into themselves, and then they start to grow again… in that awkwardly curled position. Which means that instead of growing up and out of your skin as they should, these curled and newly sharpened hairs grow in a different direction — often directly back into your skin. 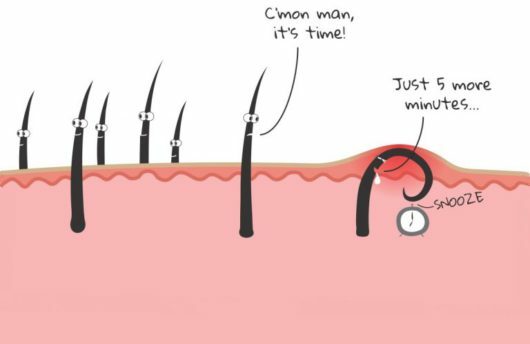 When this happens, your body treats the ingrown hair as a foreign object that’s invading, and this is why ingrown hairs are very often found underneath some sort of pimple or inflamed area. 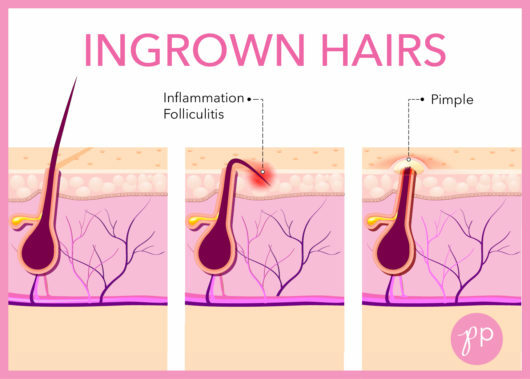 Ingrown hairs can also occur when hair follicles get clogged up with dirt, dead skin or oils. In this scenario, the hair inside the hair follicle is forced to grow sideways underneath the skin, rather than up and out of it. I’ve got an ingrown hair, now what? First of all, make sure that it really is an ingrown hair and not a normal pimple. If you can see the little hair root underneath then you can move along to getting rid of it. If not, you’re probably assuming that little bump is an ingrown hair because it popped up after your removed hair from that area. If it’s itchy and irritated, it’s most likely an ingrown hair. 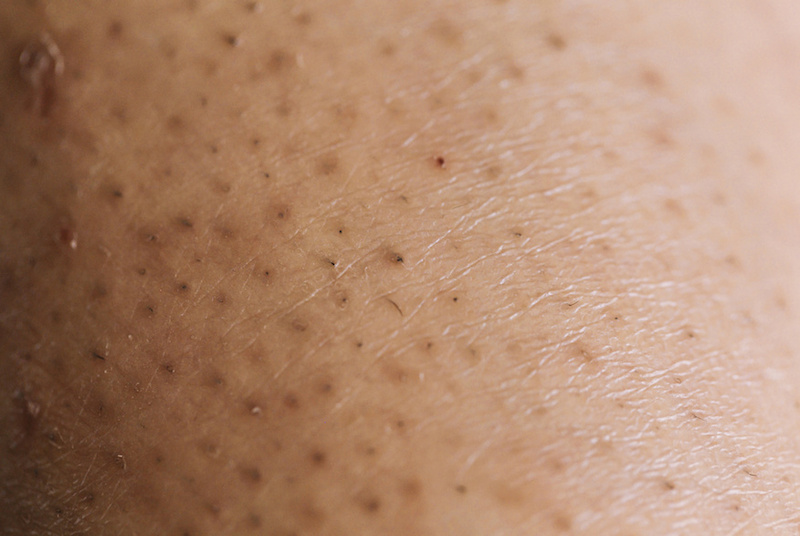 Sometimes, ingrown hairs can also cause hyperpigmentation. Once you’ve determined that you have an ingrown hair, most people will just pull that sucker out. Sometimes this works, but other times tweezing does more harm than good, especially if the hair is deep under your skin. 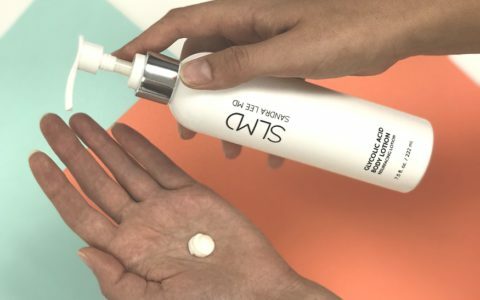 Sure, you might eventually get the hair out, but you can also unnecessarily damage your skin and introduce bacteria into a newly opened wound at the same time. Lets be real: Did you sterilize your tweezers before sticking them into your skin? Probably not. If you get a pimple or an infection after pulling our an ingrown hair, it’s likely because you introduced some dirt into the skin with your fingers or tweezers. Here’s some instructions for safely extracting that ingrown hair. 1. Soak a washcloth in warm water and press it against the ingrown hair(s) for several minutes. This will soften the hair and the skin around it, and bring the hair to the surface of the skin. 2. Using sterilized tweezers or a needle, gentle work out the ingrown hair by its end. Try to avoid plucking the hair out completely while it’s under the skin — instead, just pull it to the surface. 3. If you can’t easily remove the hair, don’t force it. Try using the warm compress again, or leave the hair alone. We know, it’s a hard ask, but try. 4. Once you’re done, wash the area with warm water and a moisturizing soap. In some instances, tweezers or a needle are not viable options. When ingrown hairs grow sideways, underneath the skin, there often isn’t an opening or piece of hair above the skin for you to pull on. When this happens a dermatologist can make a tiny incision and pull the hair out safely. If you’re someone who does remove their hair, no matter what the area of the body it is, you probably won’t want to let the forest grow just to prevent a few ingrown hairs. Instead, one of the best ways to prevent ingrown hairs from occurring is by exfoliating or gently rubbing your skin. Not only does this prevent dead skin cells from clogging up the hair follicle, it also prevents hairs from growing down into the skin and becoming ingrown hairs. We love the SLMD Skincare Glycolic Acid Body Scrub as an all-over scrub that can work to prevent ingrown hairs from curling up underneath the skin. Use it to exfoliate and prevent those pesky ingrowns! If you’re a dedicated shaver, make sure you’re shaving properly! 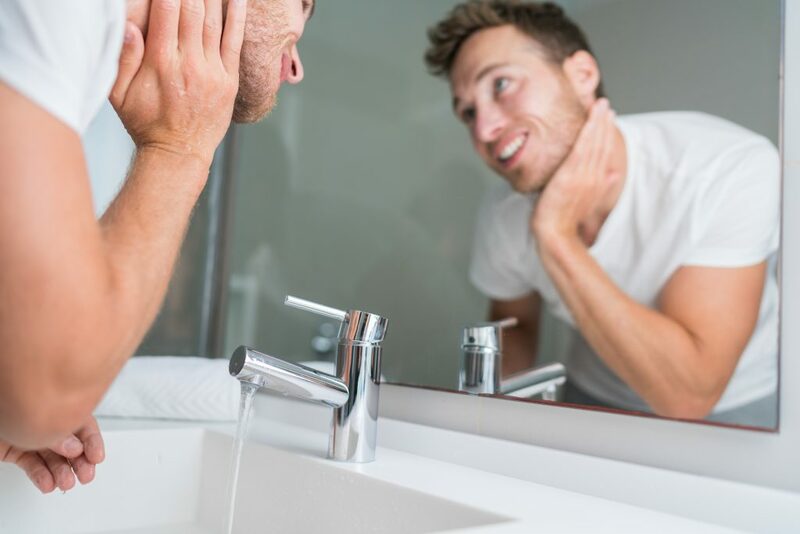 Not using a shaving aid, a dull razor blade or shaving at the wrong angle can all cause unnecessary ingrown hairs. If exfoliating doesn’t work and you still seem to have a lot of ingrown hairs, you might want to consider trying a different type of hair removal. If you shave, try waxing or even laser hair removal. They can be a literal pain, but remember, ingrown hairs are nothing to be ashamed of! Almost everyone gets them at some point in their life! Love this post! 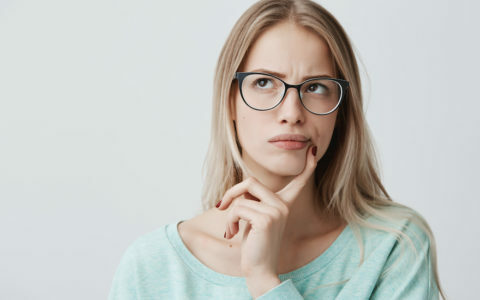 However, what if you get what seems like an ingrown hair, but a hair never comes to surface and sometimes just a little blood or nothing at all comes out of it and the thing stays under your skin? And they only happen after hair removal?! What should you do if the ingrown hair bump is infected? I think i plucked it too much with the tweezer. Very informational. What if you do wax and still get a lot of ingrown hairs and I exfoliate and still get them. What do you suggest I do? Does laser hair removal works on the black skin with thick hair? How can i get rid of hyperpigmentation? Great info, but could she say which angle we SHOULD shave at? Many thanks! My husband is African-American and shaved and early age with a razor and now has been forever plagued with ingrown hairs , his shaving routine consists of putting on a hair smoother prior to scraping the hair with a plastic straight razor and then using clippers . Is there anything that can be done to help him . Hey, great article! Just wanted to point out the typo towards the beginning. I think you meant “coarse” but it is spelled “course” on the article. That’s all 🙂 Thank you! So do you exfoliate before or after you shave? I don’t understand why I get a deep under the skin pimple that last like a week to pop, with heat, steam and exfoliating it. Huge pressure and don’t know what to do to rid of it. It’s same couple pores that do this to me a couple times a year.